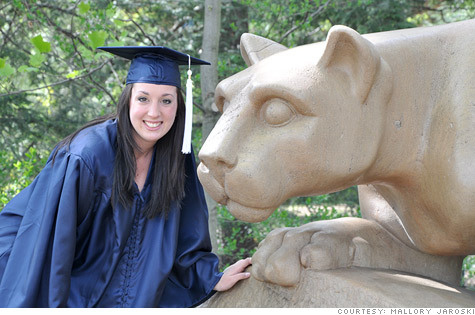 Mallory Jaroski gradauted from Penn State University in May and is living at home until she finds a job. NEW YORK (CNNMoney.com) -- Editor's note: Politifact recently called into question a survey cited in the 2010 CNNMoney article below. The survey, conducted by a company called Twentysomething Inc., found that 85% of college seniors planned to move back home with their parents after graduation. At the time, CNNMoney interviewed the head of Twentysomething, which today is no longer in business. A survey conducted by the Pew Research Center in December 2011 found that 53% of 18- to 24-year-olds are living with their parents or moved back with them temporarily during the past few years. Getting a degree used to be a stepping stone to limitless career opportunities. Now it's more of a hiatus from living under your parents' roof. Stubbornly high unemployment -- nearly 15% for those ages 20-24 -- has made finding a job nearly impossible. And without a job, there's nowhere for these young adults to go but back to their old bedrooms, curfews and chore charts. Meet the boomerangers. "This recession has hit young adults particularly hard," according to Rich Morin, senior editor at the Pew Research Center in DC. So hard that a whopping 85% of college seniors planned to move back home with their parents after graduation last May, according to a poll by Twentysomething Inc., a marketing and research firm based in Philadelphia. That rate has steadily risen from 67% in 2006. "It's peaking at levels we have not seen before," said David Morrison, managing director and founder of Twentysomething. Mallory Jaroski, 22 graduated from Penn State University in May but has been living at home with her mother while looking for a job in press relations. "It's not bad living with my mom, but I feel like a little kid. I have a little bed, a little room," she says. Jaroski thought she would stay for summer. But like many others, she's found her stay becoming significantly longer. "There's almost an expectation that kids will move back home, there is no stigma attached," Morrison said. "The thought now is to move home for 6-12 months but in reality those young adults will be home for a year and a half or longer. Even if they have jobs, they are living at home." Jessie Sawyer, 23, graduated in May of last year and moved back home with her parents while she looked for a job. She has since been hired as a local editor for Patch.com, a news site, but has yet to move out of her parents' home. "I'm trying to save up to move out," she said. But "the new job is 10 minutes from where I live so it's convenient." Even though living with her parents comes with some rules and restrictions, Sawyer says that's a small price to pay for the comfort and convenience of home. "My parents have been really supportive so if they ask me to do something like wash the dishes I feel like it's reasonable." The job picture for recent grads may be brightening, however. Employers expect to hire 13.5% more new grads from the Class of 2011 than they hired from the Class of 2010, according to a new study conducted by the National Association of Colleges and Employers. And that's good news beyond just employment. These boomerang years are "a life interrupted," Morrison said. "Time on the job is important and you won't get that time back."